April 10, 2013 By This post may contain affiliate links. Chocolate covered pretzels are always a favorite for any party, so why not step it up a notch! These Farm Animal Pretzel Pops are one of a kind cute and will make anyone smile. Did you know that today is National Farm Animal Day? Nope? I didn’t either until earlier this week. 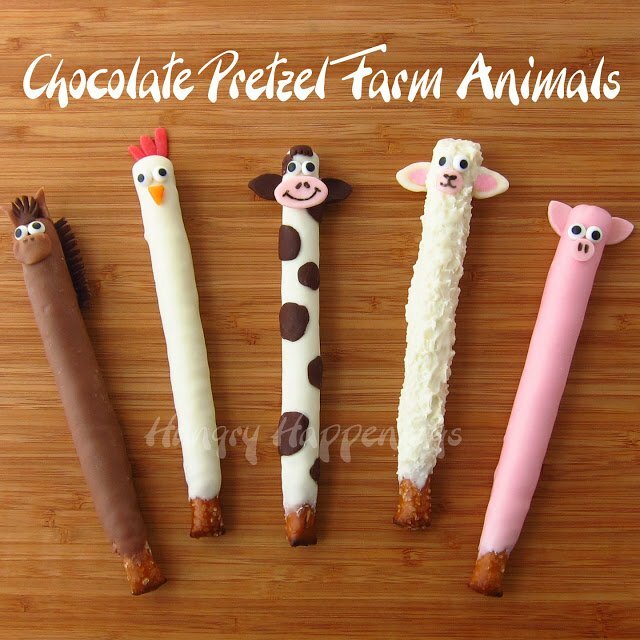 I found this little known holiday when I went searching for special occasions celebrated in April and I couldn’t let this opportunity to make these decorated chocolate pretzel farm animals pass me by. 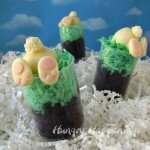 These sweet treats would be great to use when celebrating Earth Day, an animal themed birthday, or just the arrival of spring. 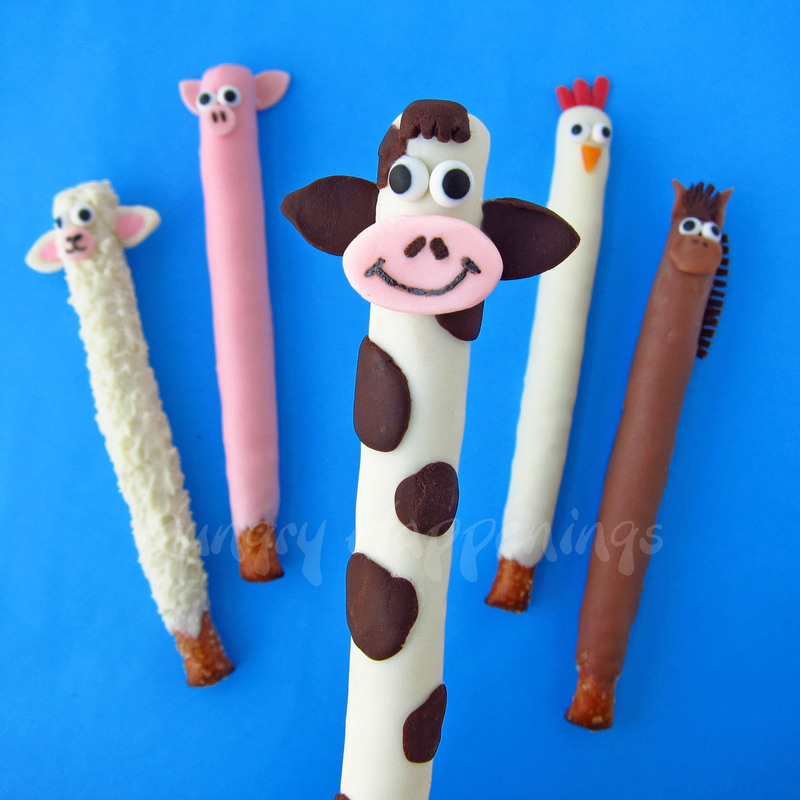 The idea to make animals using pretzel rods has been rolling around in my head ever since I saw the barnyard full of animals that Amanda, from Crafts by Amanda, made out of craft sticks. She painted and added googly eyes, felt, and buttons to ordinary wood sticks and turned them into adorable cows, horses, pigs, cats, and chickens.When you look at these farm animal craft sticks, do you see pretzels, too? I used Amanda’s basic designs (see them all here,) but made everything edible. I first dipped each pretzel rod into melted chocolate then used modeling chocolate to make most of my decorations. 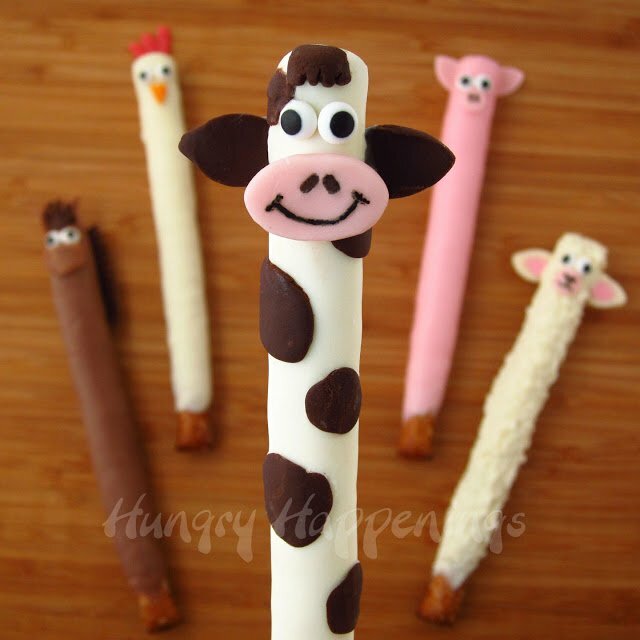 I find working with modeling chocolate to be easier than working with the candies and I prefer the flavor combination too, but you may not, so I will share ideas for using store bought candies in the tutorial.I have a zoo full of animals yet to be created using pretzel rods, so be sure to stop back by in the next week or so to see more cute creations. 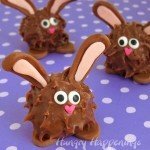 *Find the modeling chocolate recipe, coloring directions, and chocolate melting tips, here. Either dip your pretzels into the melted and tempered pure chocolate or melted confectionery coating/candy melts. If using pure chocolate, one coat will probably be sufficient to cover the pretzel rods. If using confectionery coating/candy melts, you might want to put on two coats. If making cows, chickens and lambs dip pretzels in white, if making pigs use pink, and for horses use milk. Unless you want to melt enough of each color to actually dip your entire pretzel into the chocolate, just spoon it over the surface of the pretzel, leaving the tip you are holding, uncovered. Shake off excess chocolate before setting the dipped pretzels on your parchment paper lined baking pans. Refrigerate if using pure chocolate, freeze if using candy coating just until set. If freezing, it will only take about 3-4 minutes. Don’t leave them in too long or the candy coating will crack. 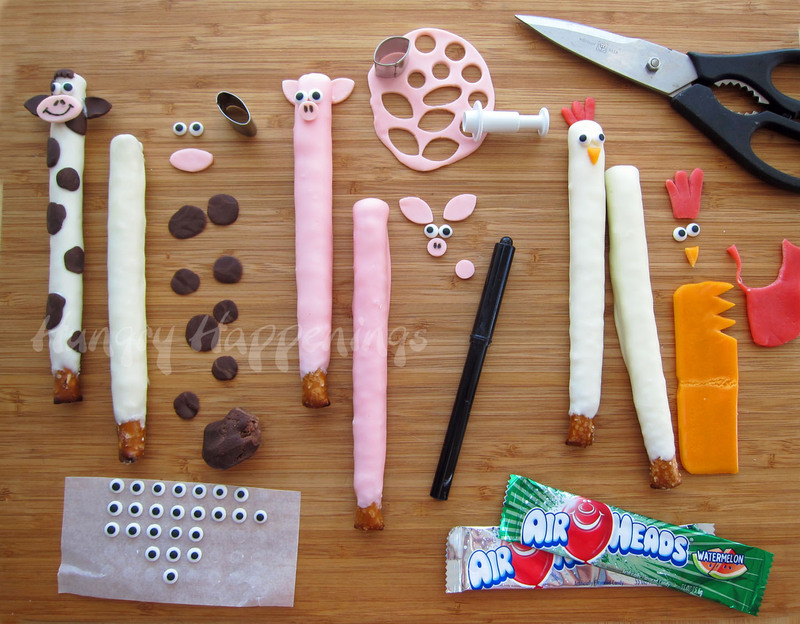 Decorate your pretzels using candy eyes and modeling chocolate or assorted candy. You can either pinch off pieces of the modeling chocolate or candy and shape them into ears, spots, snouts, beaks, feathers etc. 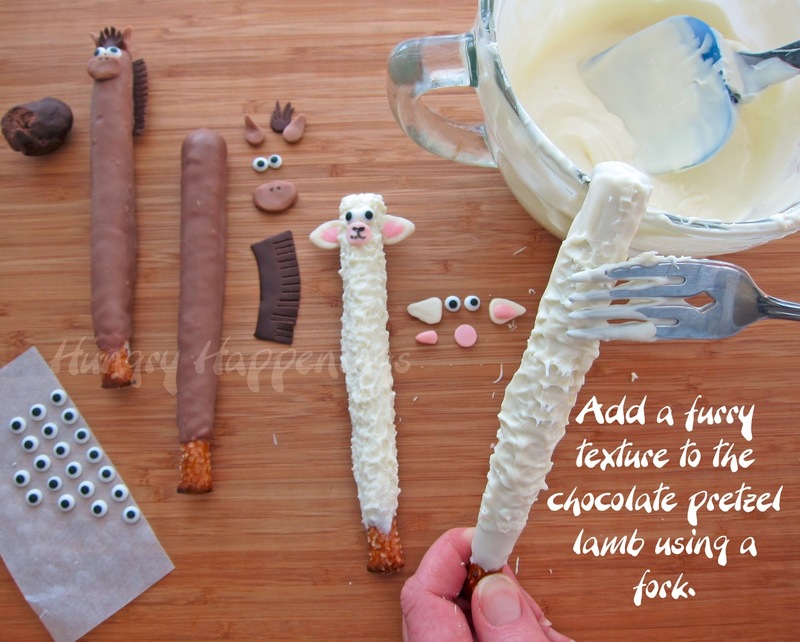 or roll the modeling chocolate or candy out using a rolling pin then cut using small metal cutters or kitchen shears. I did a combination of the techniques. Then use melted chocolate as “glue” to attach the candy to the chocolate dipped pretzels. Store your Chocolate Pretzel Farm Animals in an airtight container for up to several weeks. Wrap in clear plastic cellophane bags and tie with a bow to use as party favors for an animal themed birthday party, to celebrate Farm Animal Day or Earth Day, or just for fun.So far the cow is my favorite, but today I’m going to play around with some more designs. Which do you like best? Previous Post: « Serve basketball themed food while you watch the NCAA finals. 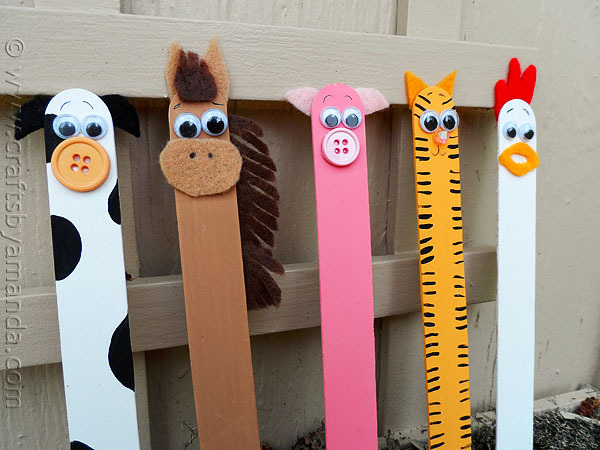 I can't take total credit for the cuteness of these designs, as Amanda made truly adorable craft sticks. I am often inspired by other bloggers, like you two! These are all so cute! Really love the horse…very creative! When I think you can't wow me again, you do. When I looked at those sticks, I thought how cute for an herb garden, but you see fun foods for all ages. You are amazing. Love these. I'm glad I can still wow you! Oh my GOSH Beth these made me smile! Love them! 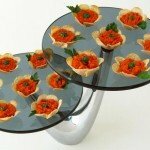 Can't wait for an occasion to make them!!! Thanks for sharing your talent! So happy they made you smile. I love that! I'm having so much fun making these pretzels. I just made some wild animals and they are so cute. I'll share later this week! Who needs an occasion? – make em now. 🙂 With all your great ideas we'll be busy for years. You asked for a favorite – think it's gotta be the lamb (the lamb/lion theme, Easter, Christmas – lots of uses for him0. I would have thought coconut for his wool, but dabbing the white chocolate with a fork is much better as not everyone likes coconut. Your photos are always so detail oriented which is great. The photo of you laying out the body parts ahead of time reminds us to be organized so we can work quickly & have enough cut-outs on hand. You make opening e-mails the best part of the day. Wild animals coming next – wow. Thanks. I'm glad you like the photos with the animal parts. I wasn't sure just how detailed I needed to be in the tutorial. I could have showed how to make each and every detailed piece, but figured the shapes were simple enough. I love the new word. Call Webster! Oh, my goodness! These are beyond adorable!! Pretty sure I could never actually eat them! 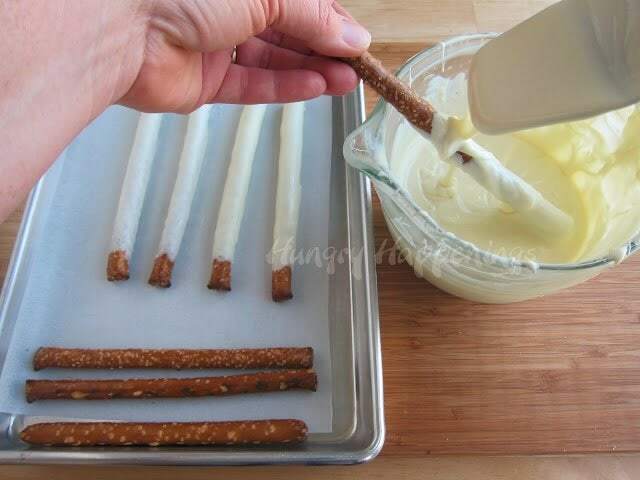 What a fantastic idea to turn the craft sticks into pretzel sticks! This summer I am throwing a joint birthday party for all of my eight grandchildren (8 and under)since the three families live in different states and the cousins never get to attend each other's parties. I picked a farm theme and these will be perfect! Thanks Beth(and Amanda too)! We lived 4 hours away from all our cousins and never spent birthdays together. Having one big party would have been so much fun. 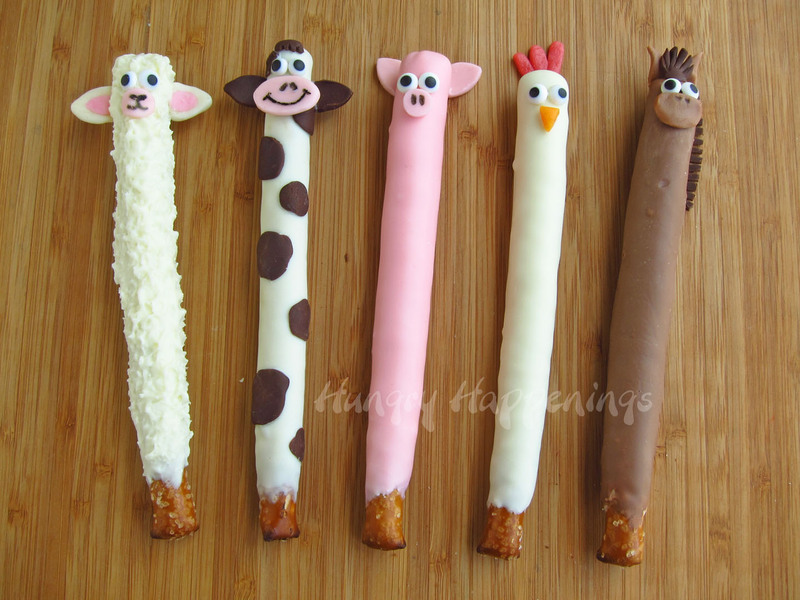 I hope you and the kids enjoy the farm animal pretzels and the party! 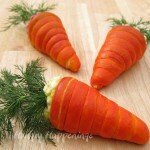 They are really very wonderful!perhaps kids will be very happy to eat it. Thanks so much for the inspiration! Your craft sticks are so much fun. Oh my! You are creative. What will you think of next? They are so cute. I want to make them with my grands…well probably the tongue depressor animals. Thank you for sharing. Thanks, Sue. These are definitely a project that kids can do with you. They'll have fun creating their own designs too. My gosh, Beth, these are TOO cute!!!! I am featuring you again this week over at Sun Scholars! Thanks for sharing your fun ideas with us yet again. You've been pinned, and I'm off to share you with my Facebook friends now! Awesome!! Wow, thanks so much for sharing these with everyone. I do appreciate it! So these are ridiculously cute Beth! Just adorable! Pinning 🙂 Thanks for sharing at Mom On Timeout! These are truly amazing! You are so creative I am in awe! 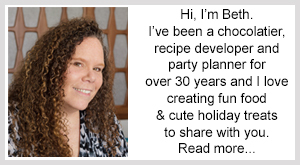 I am featuring this on TGIF today here: http://www.123homeschool4me.com/2013/04/tgif-linky-party-72.html – feel free to grab an I was featured button if you like. I'm happy you have found my farm animals and hope they are a big hit at your party. 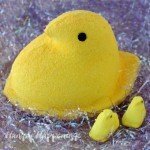 I buy most of my decorating supplies wholesale, but in a pinch have been able to find what I need from Amazon.com. I totally forgot to add links to the candy eyes in the post. I just added them now. 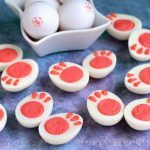 So, scroll down the post and at the very end you'll see links to several different size candy eyes. I use the 3/8, 7/16, and 1/4 inch eyes a lot. So adorable! 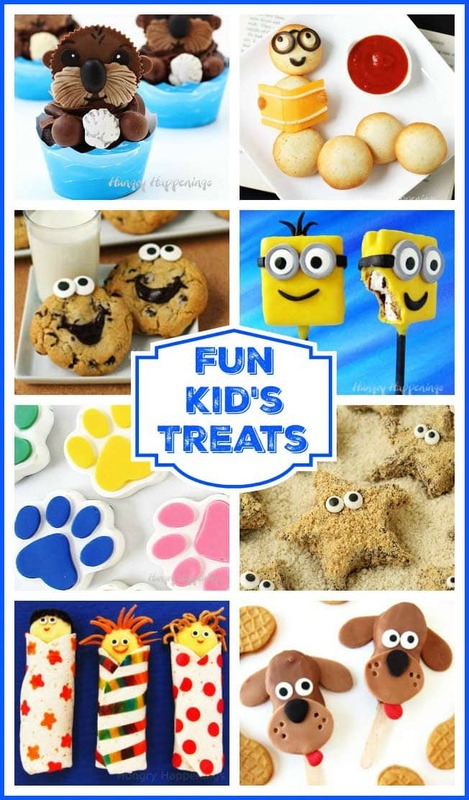 These would be perfect for a kid's party or classroom treat. I am pinning a blogging these (and linking to your page). Thanks for sharing this awesome idea with us!